Taking a bus from KL to Kluang is the locals’ preferred choice of transport even though train service is available. There are a few advantages of taking bus compared to train from KL to Kluang. Firstly, there are more frequent bus schedules than train schedules from KL to Kluang. Unlike the limited train schedules, a traveller can easily choose a bus schedule which suits his travelling plan. Secondly, due to the current upgrade of the train system, passengers are required to make a transit in Gemas before boarding another train to Kluang. Sometimes, the waiting time during the transit can be quite long. This creates additional disadvantage to train service in serving passengers from KL to Kluang. KKKL and S&S International are the two well-known operators serving bus from TBS (Terminal Bersepadu Selatan) to Kluang Bus Terminal. They are the locals’ favourite brands because of their punctuality and frequent schedules throughout the day. The bus fare is reasonably charged at RM 25.00. The bus usually takes about 3 hours from KL to Kluang, depending on traffic conditions. Because there is no toilet facility in all coaches in Malaysia, hence 1 stopover is provided for toilet break. Departures begin as early as 8:00am and as ends as late as 9:30pm. 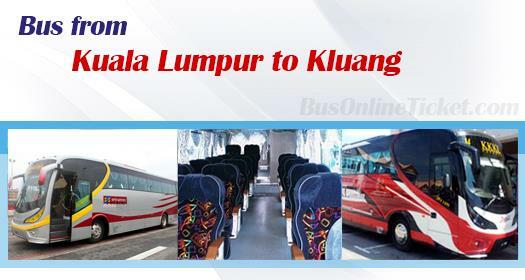 The demand for bus service from KL to Kluang is always very high, especially during the weekend. Therefore, passengers are advised to book online with BusOnlineTicket.com to secure your tickets in advance. Booking online with BusOnlineTicket.com also saves your time from going down to the counter in a bus station to buy a ticket.